Every year, at the time of the National Peoples Congress, the Supreme People’s Court and Supreme People’s Procuratorate report on IP developments. Usually, the data is sketchy and must wait until the end of April, during IPR week (around April 26). Here’s what we know so far: According to the speech given by ShengJun Wang, the president of the SPC, in 2011, the courts at all level concluded a total of 66,000 cases of first instance Intellectual property, which grew by 37.7% over the same period of last year. 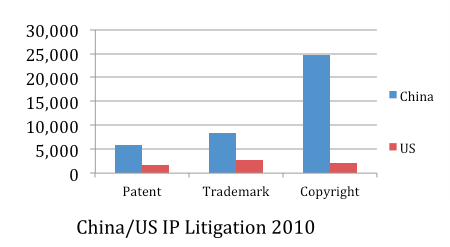 This is a remarkable number considering that China already had over 10 times more copyright cases during CY 2010 than the US, and well over 3 times the copyright and trademark caseload of the US federal judiciary. The quasi-official China Daily reported on its front page that these “Increasing IPR cases” are “a result of awareness” (March 12, 2012). What’s more, I think there might be one more reason that may be the willingness of the courts to encourage litigations to file separate cases for each act of infringement. This can result in one copyright case being split into multiple cases, and will also generate separate fees for the courts. At an AmCham event on April 12, I asked a Supreme Peoples Court judge if copyright matters, including Internet copyright matters continued to dominate the court’s docket, and whether there also continued to be growth in patent cases. He said yes. On the criminal IP side, Cao Jianming, of the Supreme Peoples Procuratorate noted that the SPP took action and prosecute suspects in the amount of 6870. As is typical of this data, however, we don’t know if these are IP-only cases or “quasi-IP” cases, such as sales of fake and shoddy goods, or illegal business operations. For further details we may need to wait another month. This entry was posted in China IPR and tagged China IP Litigation, China IPRs, copyright, internet copyright, IP development, judge, National Peoples Congress, Supreme People's Procuratorate, the Supreme People's Court, US IP Litigation. Interesting. What about damages awarded averagely in 2011? Are there figures for that? I read on an INTA 2011 report it was about 46 thousand Euro. Has this figured changed a lot by the end of 2011? And by the way, any news about the EU-Commission-based (CHN Delegation) anti counterfeit tool called Acris?